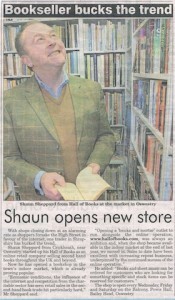 Since opening up in Oswestry Indoor Market we have been lucky enough to get some press coverage. I’m not sure I’m the most photogenic bookseller in the UK (and goodness only knows why the photographer got me to look up like this – perhaps to hide my double-chin) but the shop looks good! 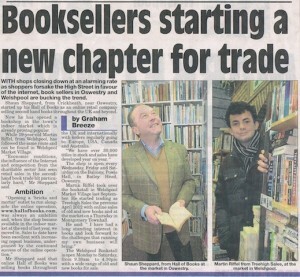 I think we got some press coverage because the press were interested in us opening up a shop as we appear to be bucking the trend, certainly here in Oswestry. There used to be a number of bookshops, new and secondhand, in the town. Now there is just W H Smith and Booka selling new books. We are the only secondhand bookshop left. Retail has been hit very hard in Oswestry with large national retailers pulling out, leaving a number of large empty shops behind. We seem to have plenty of Estate Agents, Charity Shops and Supermarkets, but small independent retailers are thin on the ground. Rent and rates are astronomic and people locally don’t have too much spare cash, so setting up in business on the High Street is all but impossible. The market is a low-cost, low-risk way to get out from behind the computer and actually meet a few customers. We didn’t realise that a young chap had done a similar things down in Welshpool (12 miles away), but the papers put two and two together and came up with the next article. It has also turned out to be an excellent way to acquire new stock. People come into the shop every day offering us books or asking if we’d be interested in their collections. To be honest, the majority are titles or imprints that we are just not interested in, but occasionally, we are offered something that we would not have chanced upon in any other way.